Rohit Sharma struck a vital half century and shared 82 runs for the fourth-wicket with Mohnish Mishra (41) as title holders Deccan Chargers beat Royal Challengers Bangalore. Rajasthan Royals captain Shane Warne said Sachin Tendulkar’s dropped catch proved to be the turning point of their crucial Indian Premier League match against Mumbai Indians here, which his side lost by 37 runs. Powered by captain Sachin Tendulkar’s blistering 89 runs off 59 balls Mumbai Indians on Sunday became the first team to qualify for the semifinals of IPL season 3 by defeating Rajasthan Royals comprehensively by 37 runs at the SMS Stadium here. Chasing 175 to win, Royals were never in the hunt and could only make 137 for the loss of eight wickets before a rejuvenated Mumbai side. Chennai Super Kings and Kolkata Knight Riders will clash in a make-or-break Indian Premier League match here tomorrow, the outcome of which will decide if they can still be in race for a semifinal spot. Both the teams need to win all the three remaining games if they are to stand any chance of qualifying for the last-four stage and the team that ends on the wrong side of the result would be out of contention. They are on equal points having won five of their 11 matches but the hosts are at the fifth place in the points table, ahead of Kolkata Knight Riders due to their better net run-rate. The hosts have a psychological edge as they have beaten Knight Riders in the away encounter but that defeat at home would push Kolkata even more for the win. US star Phil Mickelson won his third Masters title and fourth major crown in dramatic fashion on Sunday while Tiger Woods could only ponder his mistakes and wonder what might have been. Mickelson shot a bogey-free five-under par 67 to finish 72 holes on 16-under 272, defeating England’s Lee Westwood by three strokes, in an emotional victory for wife Amy, who has been battling breast cancer for nearly a year. Kings XI Punjab management today said it would not ask Yuvraj Singh to stay back if the star player has made up his mind about leaving the team after this year’s Indian Premier League. Reacting to reports that Yuvraj, stripped of captaincy, was keen to switch allegiance with a new IPL franchisee apparently showing interest in him, Kings XI Punjab co-owner Amit Burman said if the player had already decided on leaving, there was not much the management could do. “If he has given such a hint, what can I do? It’s upto him,” said a peeved Burman. “After the season is over, we will speak to him. But at the end of the day, you cannot force people to stay if they don’t want to,” he said. Sixteen kabaddi players, who participated in the 1st Pearls World Cup Kabaddi 2010, have tested positive for prohibited drugs. Some of them have tested positive for anabolic steroids while others have tested for stimulants. Those who have tested positive belong to the group of 49 players whose urine samples were collected before the Kabaddi World Cup began in various cities of Punjab. The ten day sports extravaganza Pearls World Cup Kabaddi 2010 which came to a spectacular close with India making its traditional arch rivals Pakistan bite the dust to lift the glittering cup besides a cash prize of Rs 1 crore,the members of the Indian squad had a double delight as Punjab Chief Minister, Parkash Singh Badal announced jobs for them. Rohit Sharma struck a vital half century and shared 82 runs for the fourth-wicket with Mohnish Mishra (41) as title holders Deccan Chargers beat Royal Challengers Bangalore by 13 runs to stay afloat for a semifinal spot in the Indian Premier League here today. Rohit (51 off 46) and Mohnish Mishra (41 off 30) resurrected the Deccan innings with the 60-ball valuable partnership to guide the defending champions to 151 for six after Dale Steyn (3/18) did the early damage with three quick wickets. And then the Deccan bowlers rose to the occasion with RP Singh (2/21), Pragyan Ojha (2/22), Harmeet Singh (2/24) and Ryan Harris (2/34) sharing eight wickets among themselves to bowl out the Royal Challengers for 138 in 19.4 overs. 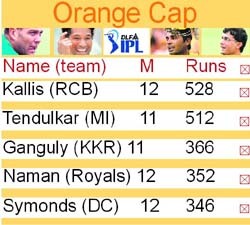 Rahul Dravid top-scored for Royal Challengers with a classical 49 while Robin Uthappa made a breezy 34 off 20 balls. Chasing the modest target, Royal Challengers did not have the perfect start as Ryan Harris struck in his and innings' first delivery for Deccan. The Australian pacer found Manish Pandey fishing at a moving delivery, only to get a thick edge which Deccan skipper Adam Gilchrist obliged with both hands. But then came in Rahul Dravid who looked in great touch. He opened his account with a copy book drive off Harris and then welcomed Andrew Symonds with two boundaries in his first over. 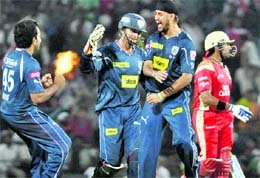 Harmeet also faced the brunt of Dravid's aggression as he hit the medium pacer for back-to-back boundaries. However, Dravid's 35-ball beautiful innings, which was studded with eight fours, was halted by Symonds just one run before the half century as the right-hander hit one straight to Sumanth at the long-off boundary. Dravid's downfall seemed to have pumped Deccan as they picked three more wickets in consecutive overs to claw back into the game. Ojha displayed some fine left-arm spin bowling and accounted for two Bangalore batsmen -- Jacques Kallis and Virat Kohli -- during his four overs spell. He first got the vital wicket of tournament's highest run-getter Jacques Kallis (25 off 37), caught by Sumanth and then had Kohli out in identical fashion. RP Singh too picked up two crucial wickets to help his side's cause. The left-arm pacer disturbed Ross Taylor's timbers with a beauty of a yorker and then picked up Cameron White in his next over, caught by Symonds. However, in-form Uthappa had other plans. Needing 39 off the last three overs, he clobbered Harris twice over the boundary to bring it down to 18 off 12 balls. But then came the deciding moment of the match as Harmeet not only clean bowled dangerman Uthappa and then had Steyn lbw in the next delivery, but conceded only one run in the penultimate over. In the end it proved to be a tall task for the Bangalore tailenders to score 17 runs off the final over as they could manage only three. Earlier, Steyn justified his captain Anil Kumble's decision to bowl first after winning the toss with double strike in the opening over. The South African pacer sent packing both Gilchrist and T Suman for one-ball duck to mark a dream start for the Bangalore side. Steyn first induced a thin edge from Gilchrist's willow in the fourth ball of the innings which Uthappa had no problems in grasping behind the stumps and then had Suman caught at the backward short-leg by Taylor after the right-hander failed to negotiate a short delivery. Fall of wickets: 1-1, 2-1, 3-14, 4-96, 5-131, 6-133. Bowling: Steyn 4-0-18-3, Vinay 3-0-19-1, Kallis 4-0-40-0, Kumble 4-0-27-1, Kohli 2-0-16-0, Appanna 3-0-27-0. Fall of wickets: 1-0, 2-74, 3-95, 4-101, 5-104, 6-110, 7-134, 8-134, 9-137, 10-138. Bowling: Harris 3.4-0-34-2, RP Singh 4-0-21-2, Symonds 4-0-33-1, Ojha 4-0-22-2, Harmeet 4-0-24-2. Rajasthan Royals captain Shane Warne said Sachin Tendulkar’s dropped catch proved to be the turning point of their crucial Indian Premier League match against Mumbai Indians here, which his side lost by 37 runs. Aditya Dole dropped Mumbai skipper Tendulkar while on 45 off Siddharth Trivedi and the champion batsman later went on to make a 59-ball unbeaten 89 to guide Mumbai Indians to a competitive 174 for five. “Dropping Sachin’s (Tendulkar) catch hurt us costly because he went on to score the runs. We also responded poorly in the bowling and fielding department after the missed chance,” Warne told after Mumbai Indians beat his side by 37 runs to become the first team to enter IPL III semifinals. The legendary Australian leg-spinner, who guided Rajasthan to the Inaugural IPL title in 2008, also said that they did not help their cause by their irresponsible running between the wicket while chasing. “We conceded 60 runs in the last four overs. I know these things happen but we had a bad start to our run chase. A few runs outs also hurt us. But we batted deeply with Aditya Dole and (Abhishek) Raut adding few crucial runs in the end. 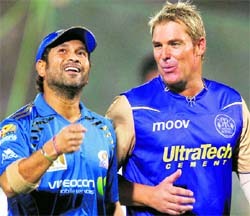 It was not at all a good time to lose a match,” Warne said. Mumbai Indians skipper Tendulkar said although he got a life on 45, he was satisfied with his innings today as it came under difficult circumstances. “Sometimes catches are dropped sometimes run outs are missed, these things happen in cricket. But though I was dropped on 45, in the end I had to score runs after getting the life,” Tendulkar said. “I don’t play to prove anything to anybody. The source of inspiration for me is that I am playing for enjoyment. I am playing well and it feels nice. Today, I enjoyed my batting because it was challenging initially and then I had to be patient in the middle. I had to plan the innings. When big shots were required they came in and it was very satisfying,” he said. The run chase for the Royals got off to disastrous start with the hosts losing their first three wickets for just 11 runs in 2.4 overs, which included key batsmen like Lumb, Ojha and Watson. Even after losing early wickets, Rajasthan batsmen didn’t make any effort to steady the innings and lost two more wickets to needless run outs. With the run rate mounting with each delivery and only tail-enders left to bat the last pair of recognised batsmen - Voges and Yusuf - too lost their wickets. Tail-enders Raut and Dole added 50 runs for the 8th wicket but it was too little too late. Earlier, put into bat by Rajasthan Royals, Mumbai Indians scored 174 at the loss of five wickets despite losing some early wickets, thanks to a brilliant knock by Tendulkar. The Mumbai skipper’s blazing innings was studded with 10 fours and two sixes. He scored 20 runs with the help of two consecutive sixes and a four in the last over to take his side to a fighting total. 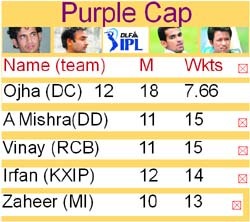 He was dropped at 45 by Rajasthan pacer Aditya Dole in the 15th over which cost dearly to the Royals. Jolted by two consecutive defeats, the Mumbai Indians brought in swashbuckling Sri Lankan batsman Sanath Jayasuriya back into the team but the move didn’t pay off as he lost his wicket in the second over to Watson after scoring one run. Fall of wickets: 1-12, 2-12, 3-30, 4-93, 5-143. Bowling: Yusuf 4-0-24-0, Watson 4-0-37-3, Dole 3-0-34-1, Jhunjhunwala 1-0-6-0, Warne 4-0-34-0, Trivedi 4-0-35-1. Fall of wickets: 1-9, 2-9, 3-11, 4-34, 5-62, 6-85, 7-87, 8-137. Bowling: Zaheer 4-1-17-2, Kulkarni 4-0-40-1, Malinga 4-0-23-0, Harbhajan 4 -0-21-1, Jayasuriya 2-0-16-0, Pollard 2-0-19-1. Chennai Super Kings and Kolkata Knight Riders will clash in a make-or-break Indian Premier League match here tomorrow, the outcome of which will decide if they can still be in race for a semifinal spot. Both the teams need to win all the three remaining games if they are to stand any chance of qualifying for the last-four stage and the team that ends on the wrong side of the result would be out of contention. They are on equal points having won five of their 11 matches but the hosts are at the fifth place in the points table, ahead of Kolkata Knight Riders due to their better net run-rate. The hosts have a psychological edge as they have beaten Knight Riders in the away encounter but that defeat at home would push Kolkata even more for the win. Both the teams are coming into the clash after defeats in their last encounters and an exasperated Sourav Ganguly even went to the extent of saying that his side played “rubbish” on Saturday against Royal Challengers Bangalore and did not deserve to be in semifinals. It remains to be seen how Ganguly, who has been a great leader, motivates his player to live up to challenge after publicly critisising the side. 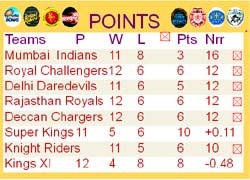 Chennai have a solid team on paper but performed below par. The top order performance would be key to their fate although they have made efforts to add sting to their attack by adding Australian paceman Doug Bollinger. Matthew Hayden at the top and skipper Mahendra Singh Dhoni in the middle-order have not been to their destructive best but tomorrow is the time when they will have to come out of the shell. Considering the hot weather conditions and slow nature of the pitch at the M A Chidambaram stadium, getting the right combination will also be a challenge and crucial to teams' strategies. Even Sachin Tendulkar, a seasoned batsman and a stalwart of the game, struggled to adjust to conditions here in the last match. “It has been an emotional year,” Mickelson said. “I’m very proud of the fight and struggle she has been through. It has been very difficult and very emotional. To be on the other end and feel the jubilation is incredible.” Mickelson made a tearful embrace with Amy behind the 18th green. She had been unable to travel to events where he played until this week and had been bed-ridden until Sunday when she came to see him at Augusta National Golf Club. “It means a lot to share some joy together,” Mickelson said, his voice cracking, as he was presented the green jacket symbolic of Masters supremacy. “It’s something we will remember the rest of our lives.” The contrast was stark between fan favourite Mickelson, who took time away from golf to be with his wife and mother during their fight, and Woods, whose return this week from a five-month layoff came after a humiliating betrayal of wife Elin, with more than a dozen women claiming sexual affairs. Kings XI Punjab management today said it would not ask Yuvraj Singh to stay back if the star player has made up his mind about leaving the team after this year’s Indian Premier League. Reacting to reports that Yuvraj, stripped of captaincy, was keen to switch allegiance with a new IPL franchisee apparently showing interest in him, Kings XI Punjab co-owner Amit Burman said if the player had already decided on leaving, there was not much the management could do. Later 61 urine samples and 22 blood samples of the players were collected during the championship out of which all the 22 blood samples have turned out to be negative. And out of the 61 urine samples, 28 were tested till Monday evening, and 18 have turned out to be negative. But ten samples have been held back for retesting as there was suspicion of doping. The urine and blood samples were tested at the National Anti-Doping Agency. NADA director general Rahul Bhatnagar told The Tribune that the pre-competition tests had a salutory effect on the participants as the in-competition tests have mostly turned out to be negative, barring the ten cases referred back for retesting. He said blood samples were taken for tests at the NADA for the first time as a prelude to the testing of samples during the Commonwealth Games. Bhatnagar said the tests were conducted expeditiously as Union Minister for Youth Affairs and Sports Dr M.S.Gill was keen that the results of the tests were announced before the World Cup was over to nail the guilty. The 16 who have tested positive for banned substances are: Lakhviner Singh Deol (3oH Stanozolol and 16B OH Stanozolol -anabolic steroid, Mephentermine and its metabolite - stimulant), Sandeep Kumar (mephentermine), Bachitar Singh (Drostanolone metabolite--anabolic steroid), Harpreet Singh (mephentermine and its metabolite phentermine - stimulant), Sheelu (mephentermine and its metabolite -stimulant), Vikram Singh (mephentermine and its metabolite - stimulant), Keval Singh (higher concentration of 11-Nor-A9-tetrahydrocannabinol-carboxylic acid-CHC - metabolite of marijuna), Talwinder Singh , Bijender Singh, Harpreet Singh, Harwinder Singh, Anil Kumar, Atma Singh, Gurpiar Singh , Balvir Singh and Satnam Singh. Badal who was the chief guest at the prize distribution function of the tournament said that the decision to induct all the players of Indian kabaddi team to Punjab government jobs would be taken formally in the next meeting of the Cabinet to be held on April 15. Speaking on the occasion, Deputy Chief Minister, Sukhbir Singh Badal announced to hold eight nation Punjab Gold Cup International Hockey Tournament later this year on the pattern of World Cup Kabaddi.